Review of Lincoln Center Jazz Orchestra, w/ Wynton Marsalis at Tanglewood 06/27/03. 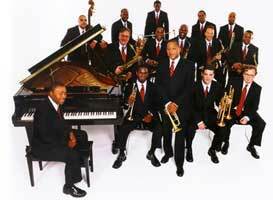 Lincoln Center Jazz Orchestra with Wynton Marsalis performed at Tanglewood June 27, 2003. This is the LCJO’s “Rhythm is our Business” tour so let’s mention the rhythm section first: Eric Lewis, piano, Carlos Henriquez, bass, Herlin Riley, drums. Second thing to say about them is that the second set was their’s, a set consisting of but one number, John Coltrane’s A Love Supreme, which we didn’t time but must have run 45-50 minutes. The first segment of the piece built up to Henriquez’ haunting bass solo with the rest of the band chanting/intoning “a love supreme, a love supreme…”. Instead of being a tasty coda, that just gave way to a searing sax solo and then came “top professor” Eric Lewis’ virtuoso piano solo that not only kept the audience rapt for a long time but also seemed to stun his colleagues, who peered at him in awe and looked at each other with expressions that ranged from disbelief to joy. All the while in the back sat Herlin Riley, keeping time, always smiling, glancing over his left shoulder at Mr. Marsalis, and then he started hitting the rim and sides of his drums and we were off to rhythm heaven – all we can report is that it’s a beautiful place. Mr. Riley’s tour de force elicited movement from everybody in the house, of course, except for professor Lewis, who looked as if he were alone in a mountain-top monastary, head bowed before an altar. The collegial leader Wynton Marsalis, who was a warm and witty m.c. throughout the concert, and spoke of his special affection for Tanglewood (but mumbled the not-that-long-ago year of his T.M.C. fellowship! ), remained seated for his own lofty solo which coalesced the extraordinary rendition of Coltrane’s eloquent composition, and brought the most-appreciative audience to its feet for a prolonged and heart-felt ovation. Lastly, the first half consisted of the Marsalis composition Back to Basics followed by the novelty of a 3-minute rendition of Fletcher Hendersons’s arrangement of Ravel’s Bolero, then LCJO trombonist Ron Westray’s arrangement of the Charles Mingus tone poem The Black Saint and the Sinner Lady, Billy Strayhorn’s arrangement of George Gershwin’s Rhapsody in Blue, and closing with Duke Ellington’s Diminuendo and Crescendo in Blue. Marsalis and the LCJO last performed here on July 25, 1999, sharing the stage with Seiji Ozawa and the Boston Symphony Orchestra for a program in celebration of the centennary of Duke Ellington‘s birth. The featured composition that night was Edvard Grieg’ “Peer Gynt Suite” and the program alternated between Marsalis leading the LCJO in Billy Strayhorn and Ellington’s arrangement with Ozawa leading the BSO in the Grieg score of the same passages. Pretty cool.